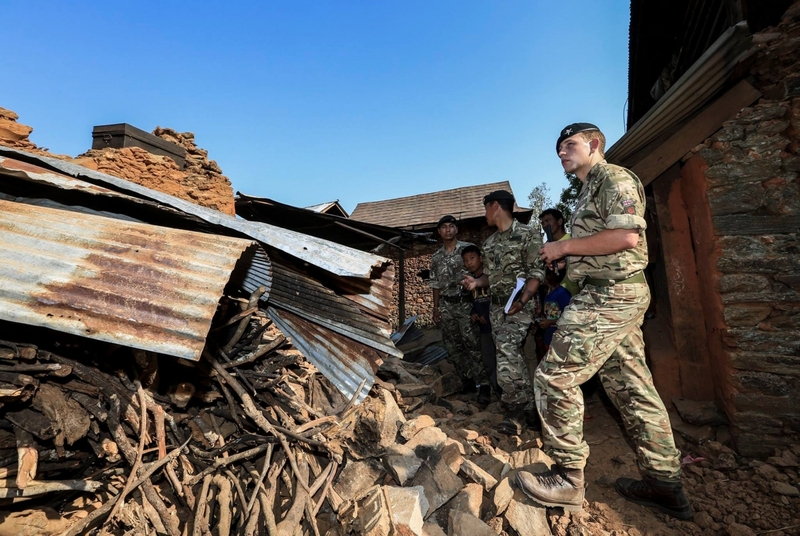 Following the devastating earthquake in Nepal, members of the Brigade of Gurkhas have been working hard to assist their fellow countrymen with rescue, aid and reconstruction projects taking place across the country. Soldiers from QGE and RGR have joined the troops permanently stationed in British Gurkhas Nepal based in Kathmandu and Pokhara to assist with aid pack distribution, shelter construction and clean water projects in the aftermath of the major quakes that have hit the country over the past weeks and their subsequent aftershocks. While the focus has shifted away from the rescue of survivors trapped in rubble, a new threat in the form of the impending monsoon looms making water and shelter from the elements priority effort. The work of the Gurkhas so far has been vital in ensuring that the people in the worst affected areas do not get hit by disease or starvation with the RGR teams alone having already distributed over 670 temporary shelters. The initial quake struck right in the traditional Gurkha heartland with its effects felt in Kathmandu, where many buildings were destroyed, and at Mount Everest where a number of avalanches hit the climbers in the region. HQ British Gurkhas Nepal (BGN) in Kathmandu was immediately tasked with providing assistance in the local area while sending updates back to the UK providing important situational awareness. BGN subsequently became part of the logistics and management of the UK military relief efforts. Gurkha soldiers were sent out patrols to the remote areas to find out the impact of the earthquake and direct emergency aid there. The Brigade of Gurkhas will continue to assist Nepal over the coming weeks and months while the people rebuild the homes and villages destroyed by the earthquakes. The public support from Britain has been over whelming with over £115 million pounds in aid sent to Nepal through a mixture of government funding and public donations towards the various Nepal disaster appeals. If you would like to help the victims of the Nepal earthquakes, please visit the GWT’s earthquake appeal fund.